It’s Christmas Eve and Lizzie Carter’s been engaged for the grand total of one hour when her private investigator fiancé Jack announces he has a confession to make - their holiday season plans need to be put on hold so that Jack can take on a new case! A priceless necklace has been stolen from the hotel bedroom of a movie star actress and the woman in question insists Jack’s the man to track it down and bring it back safely. Lizzie decides to turn amateur sleuth and tag along to help Jack out – two heads have got to be better than one, right? Plus, she can’t miss out on a chance to get inside the fabulously exclusive Roseby Hotel and admire their amazing festive decorations. 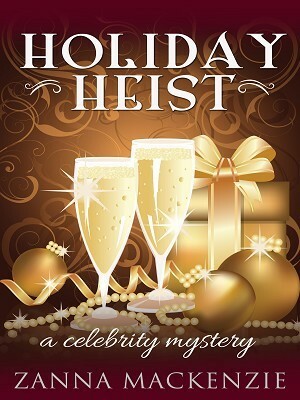 Can they solve the mystery, catch the thief who masterminded the holiday heist, return the necklace to its rightful owner, and still get to celebrate Christmas Day as planned? The Celebrity Mystery series and the Amber Reed Mystery series combine amateur sleuths, secret agents, celebrities, romance, comedy and adventure into fun cozy mysteries.